Wanting the shape but not the content for the peak of the great room, Lisa finally settled on a flora motif. Each petal depicts a different shape and color of rose, all linked by the vine running along the inner rim. Thus the pun. In order not to over crowd the image Lisa choose to keep the eight smaller circles simple geometrics. They are composed of five interlocking circles, one of the hardest things She has ever done! She had to scrap one entire, completed piece (15 hours of work) because the small circles of lead came were not perfectly round. You might not think it, but even the slightest deviation drew the eye right to it. There are two colors of gold glass in these panels. Both are 40 year old antique, mouth blown glass, impossible to get anymore. 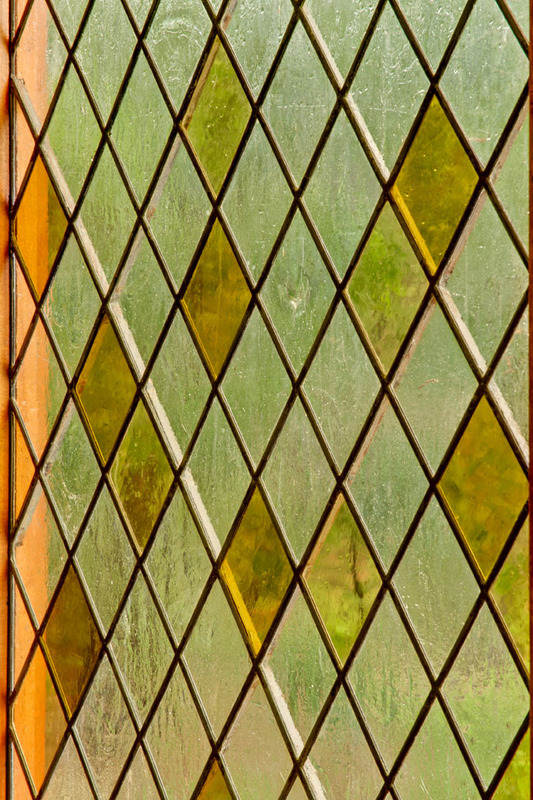 The style of interspersing, in apparently haphazard fashion, colored with clear glass is called "accidentals". In the middle ages when stained glass windows became more common, they were constructed like this, of many small panes because flat glass could only be produced in small sheets. When a pane broke it was, impossible to replace it with the exact same color so people took whatever was available. Eventually, mixing colors, as if panes had "accidently" broke, caught on as a style of its own. The trick is not only to get the proportions of color to clear right, in this case about 38% color, but placing them in what looks like a random manner. That is much more difficult that you might think. Lisa spent hours putting the two golds on the paper blueprint and moving them around, then had Elliot come in to double check that Lisa did not have a pattern going that she was not seeing. Lisa did it twice in order for the windows not to be copies of each other. In the background is an interpretation of a mountain peak viewed through the surrounding cliffs and the valley leading up to the mountains, with a sunset sky at the top. 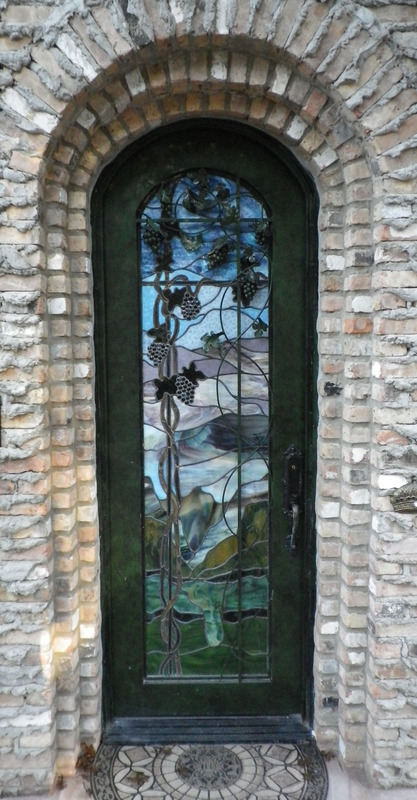 The door frame itself was custom made with a metal trellis, vine, grape bunches and leaves on the outside. Lisa created the pattern to mirror this, though it does not show up well in the picture. Created by Lisa Chronister, my wife, this window was intended as a visual pun. In art and architecture the term "rose window" refers to the element of a Gothic cathedral placed over the door or in the transept ends. 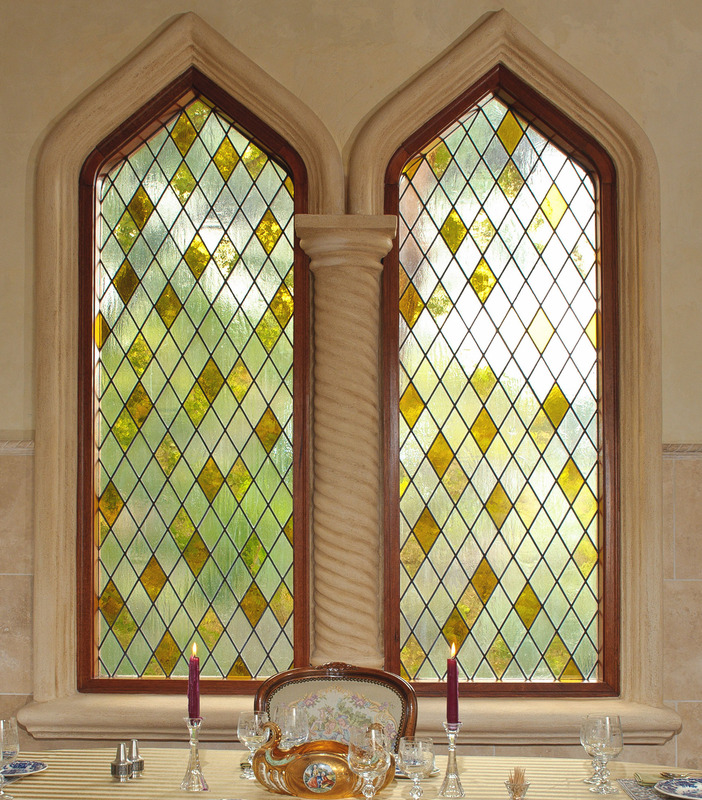 Its circular shape, geometric segments and tracery gave it a multi-petaled look eventually leading to it being named after the English rose. In churches, the design was always religious oriented, with images of apostles, prophets, saints, angels in various Christian themes. 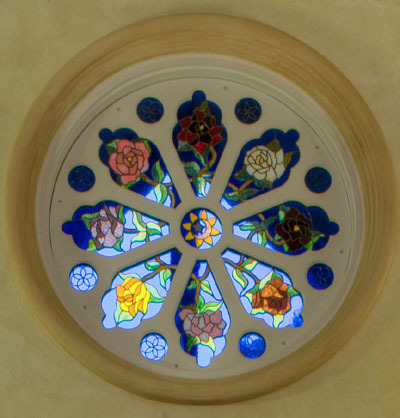 The general, shape of this window most closely resembles that of the rose window in Beverley Minster, Beverley, East Riding of Yorkshire, England from the 18th century. 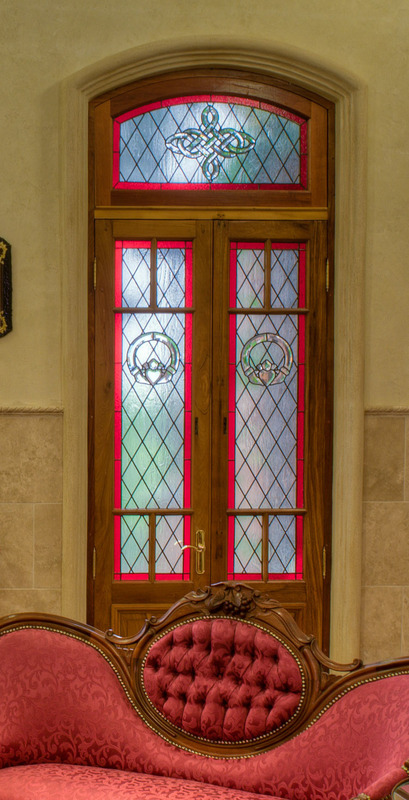 Lisa was looking for something simple, elegant and sort of Irish for these doors. 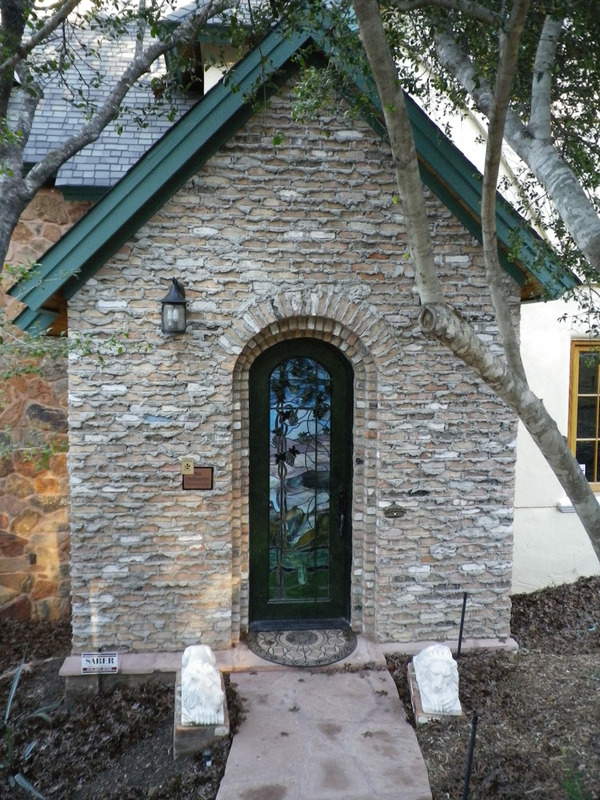 The bevel designs in the four doors are called a claddagh, a traditional Irish ring given as a token of love, originating in the Irish fishing village of the same name and first produced in the 17th century. It is a pair of hands holding a heart, surmounted by a crown. The bevel elements in the two transoms are also traditional Celtic knots, a decorative motif that dates back almost 2,000 years. She picked the red to complement the furniture upholstery and the diamond shape to co-ordinate with the Gothic windows. 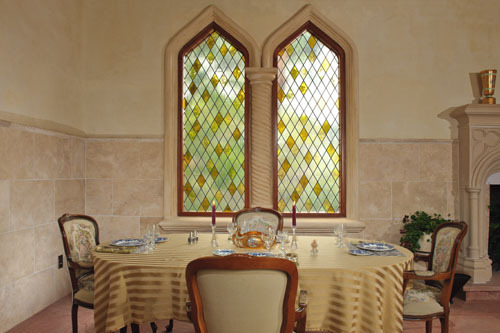 Originally we did not know what to do with these windows beyond Tudor architectural diamond shape, until we saw the movie Elizabeth I. In it the queen was portrayed sitting on her throne surrounded by ladies in waiting with a backdrop of stained glass in just this style. Immediately we knew we had to have that for our windows and after pausing the movie, we painstakingly counted the number of colored verses clear windowpanes to ensure we got the ratio correct. This was one of the first large pieces Lisa made. It was completed shortly after we moved into phase one of the house. 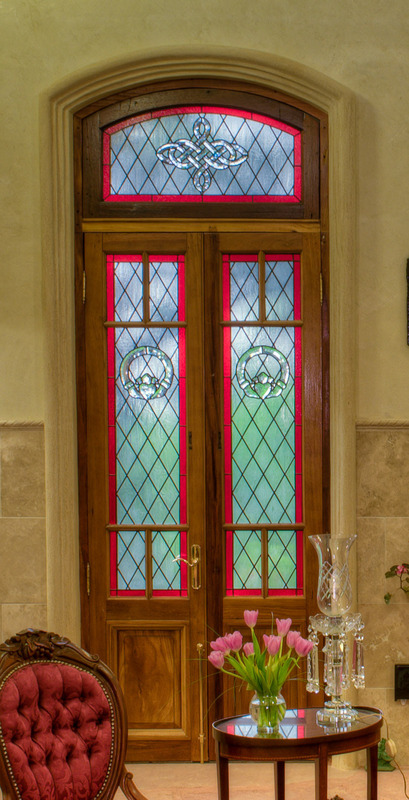 It is loosely based on a Louis Comfort Tiffany window of wisteria vines and mountains. In the foreground is a grape vine wrapped around a trellis, with leaves and grape bunches made of purple "jewels."